There are so many false claims and beliefs out there! It's very important to us to make sure everything described on our website are facts that are backed by science and approved by USDA our accredited veterinarians. The Bengal cat is a man-made cat, it does not exist in nature. 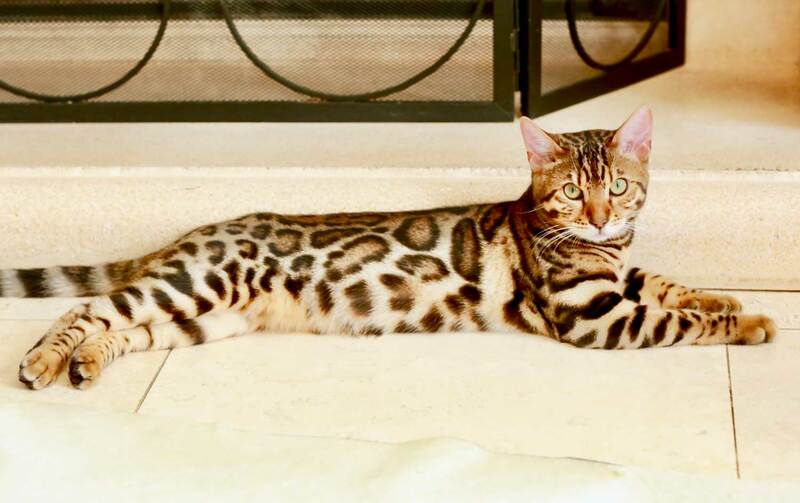 Bengals are the world’s most famous and highly desired “Designer Cats”! Bengals are bred to “look like” miniature leopards, but they are not actually wild leopards. This should not come as a surprise to people, as we humans have "made" lots of animals and vegetation that we now see them as the norm or standards. Just think of all the the different breeds of dogs, cats, horses, rabbits, chickens, cattle, guppies, goldfish and koi. Apples, carrots, corns, roses, tulips, iris, orchids, etc. are also on the list…just to name a few. Bengal Cats were originated by breeding the Asian Leopard Cat with domesticated short-hair back in 1963 by the creator of the Bengal Breed Jean Mill. Through proper breeding programs, today's Bengal Cats are recognized by The International Cat Association and The Cat Fanciers' Association as an official “domesticated breed” of cats back in 1986. Bengals are recognized by biologists as it’s own “specie” of cat, the scientific name for Bengals is Felis Bengalensis. Today's SBT Bengal Cats are not hybrids from wild Asian Leopards. 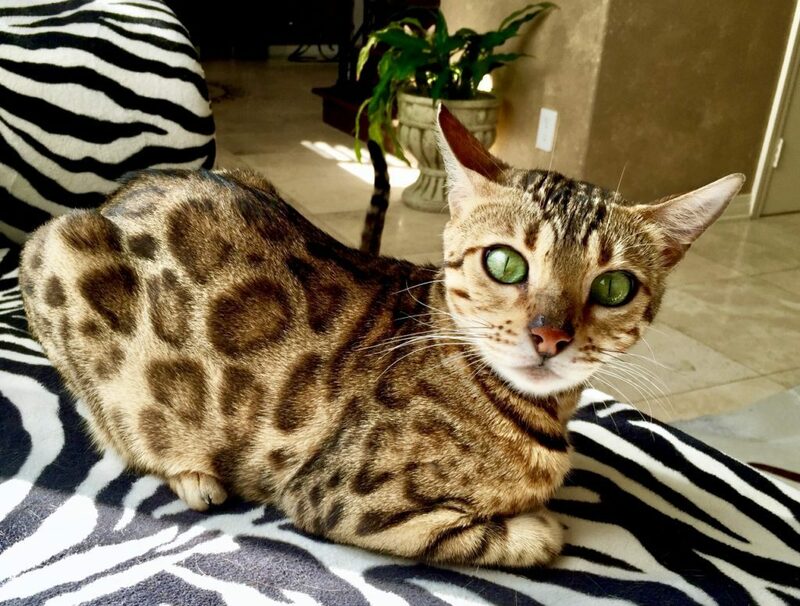 Today’s Bengals are “designed” to have the wild and exotic looks of a leopard, but their temperaments are very much domesticated; not aggressive, not wild. Despite false beliefs, pure bred pedigreed SBT Bengals are NOT wild cats, they only "look" wild. Adult males are about 8-15 lbs. and adult females are about 7-10 lbs. 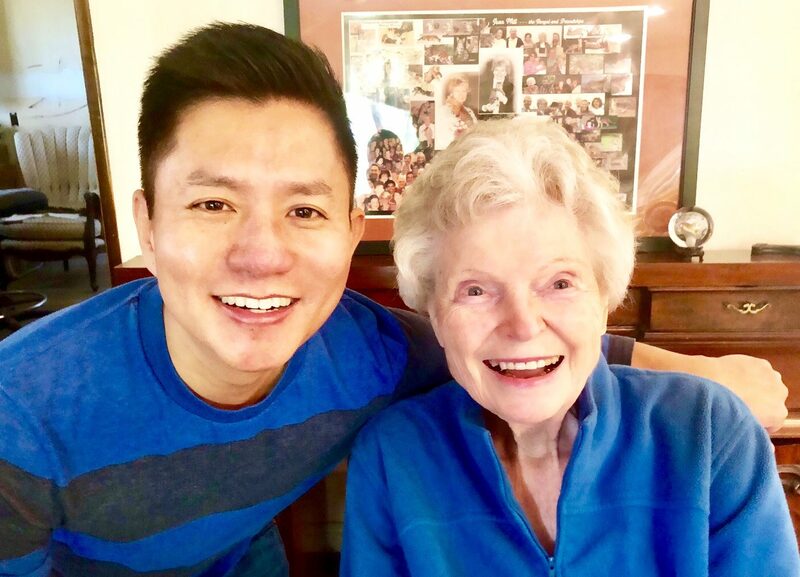 I had the privilege to have met the creator of Bengals, Ms. Jean Mill before she passed away. I loved the conversation we had, and I’m so glad that she thought my cats were true to her vision of what Bengals should look like. 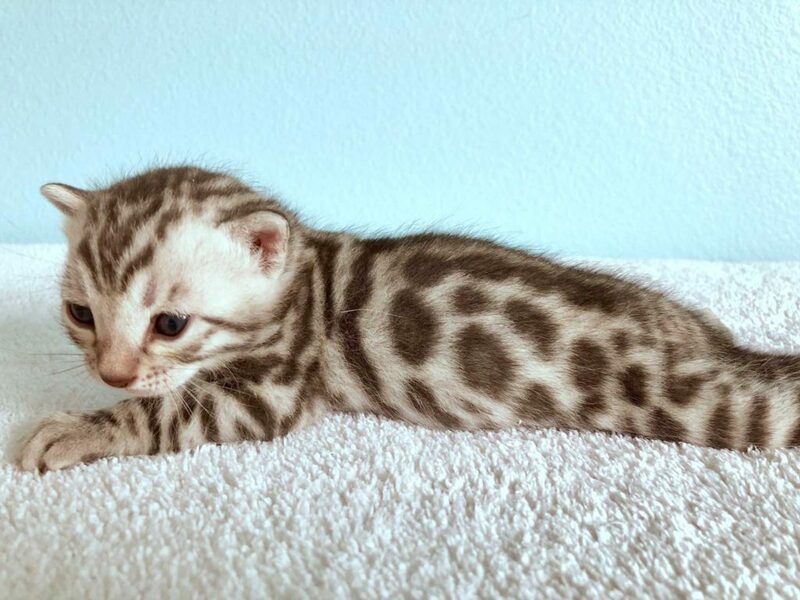 Today’s Bengals are bred to resemble wild leopards. 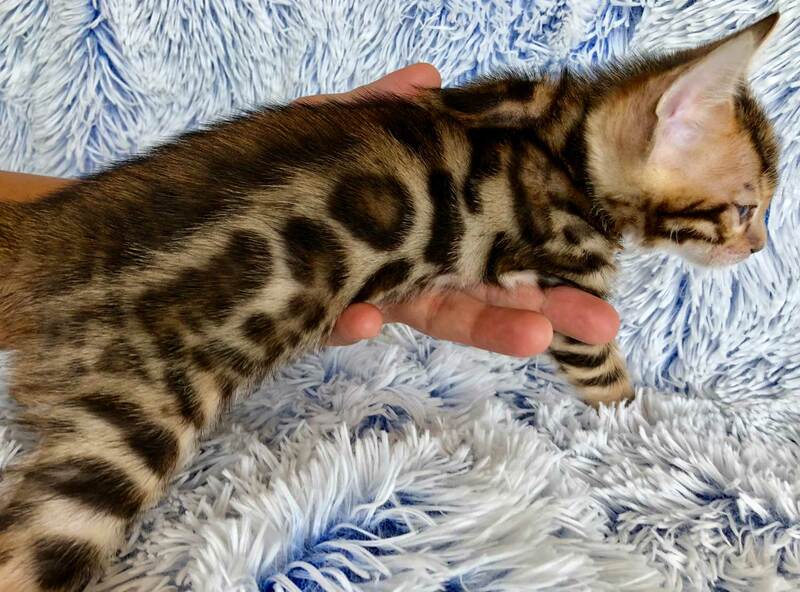 A quality bengal will have the leopard markings all over it’s body. These markings are often called rosettes. 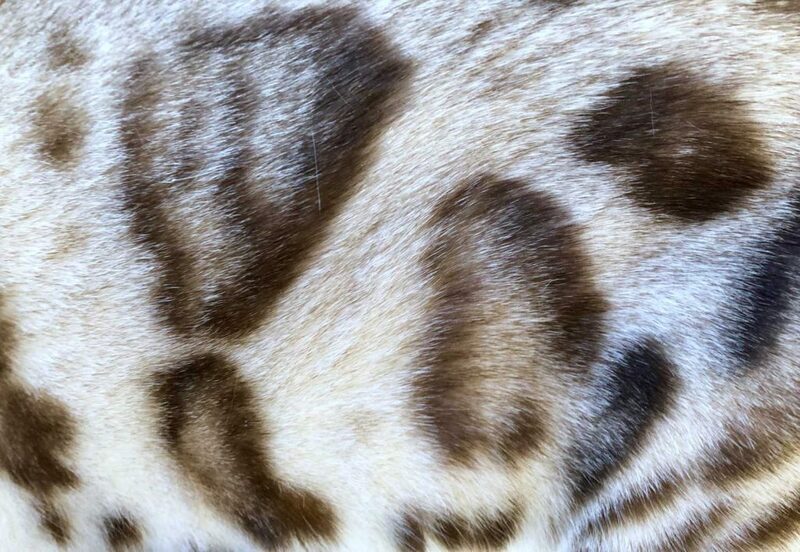 There are basically two types of markings on Bengals. 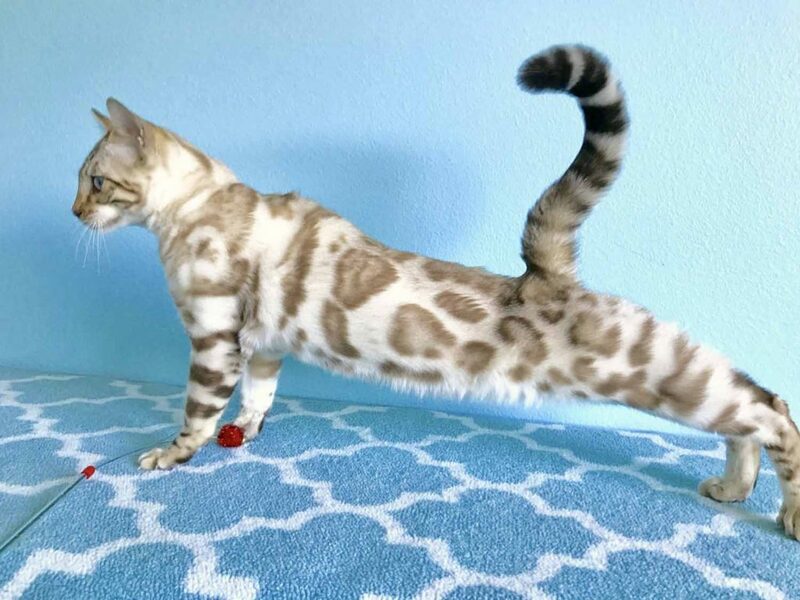 They are the spotted/rosetted and marbled Bengals, both types of markings appear in all colors of Bengals. 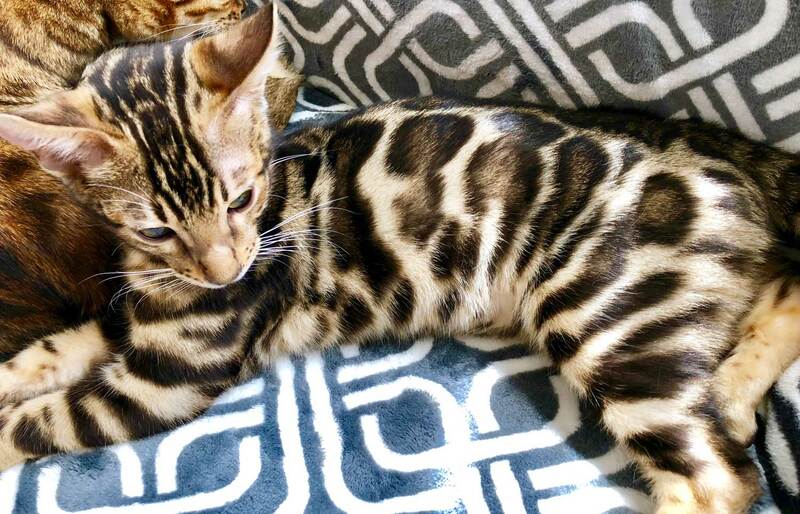 Usually Marble Bengals are priced lower, because they have lost the “leopard print marking”, instead they are just large swirls of irregular coloring. 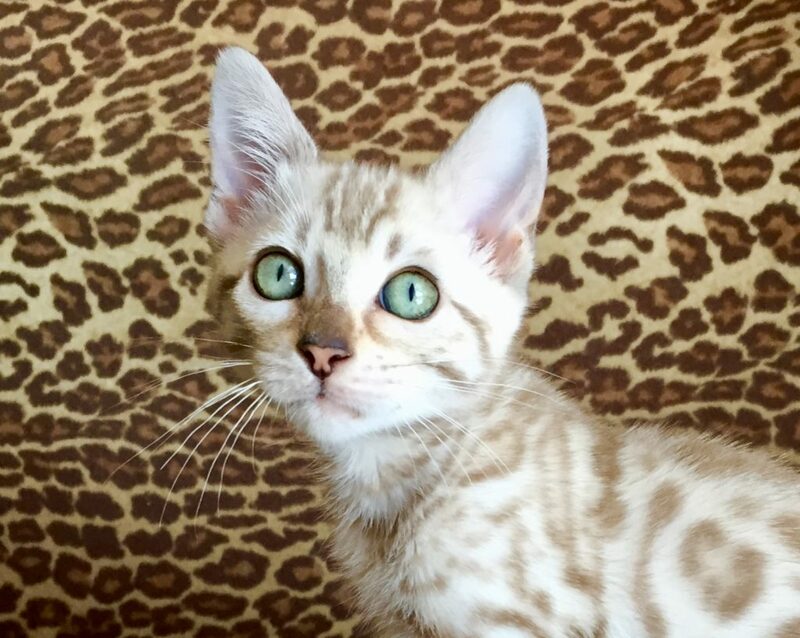 At our cattery, we only breed Spotted/Rosetted Bengals. 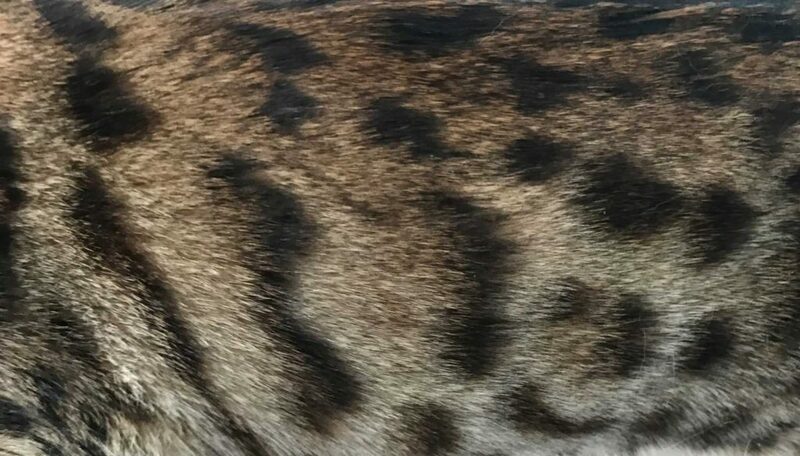 Huge irregular Spots/Rosettes are called Clouded Leopards, because they resemble the large markings of the wild Clouded Leopard without actually using a drop of actual Clouded Leopard blood. A well designed Clouded Leopard Bengal is highly prized because of the dramatic markings. 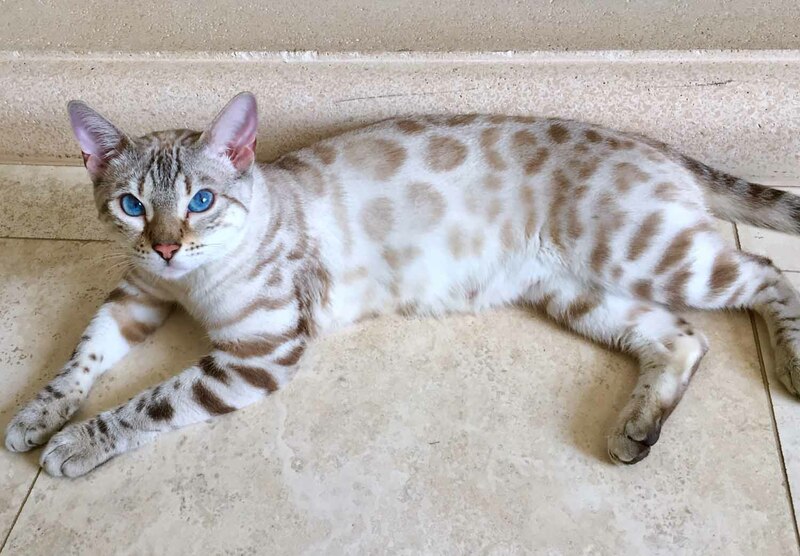 Brown Bengals generally have green or golden yellow eyes, Snow Bengals have blue or aqua eyes, Silver and Charcoal Bengals usually have golden yellow or green eyes. 1. 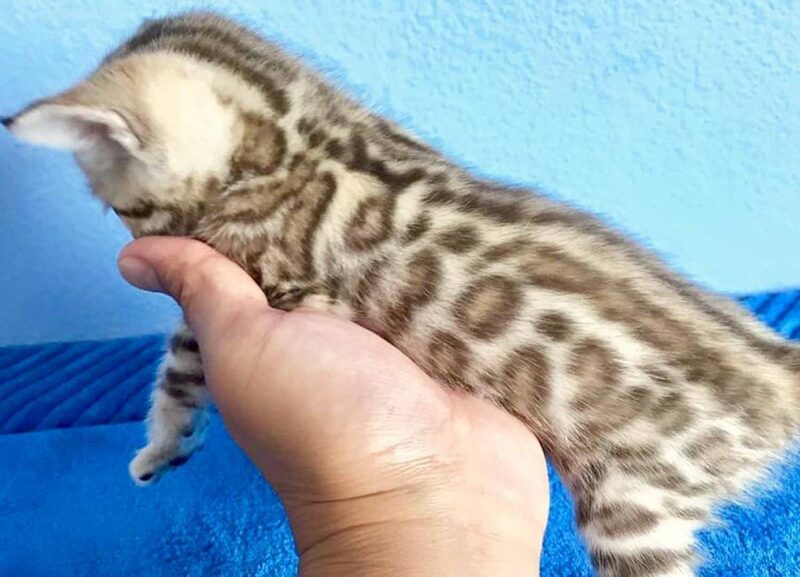 Early generation Bengals have small markings, some are just dots, some have very small leopard print. 2. 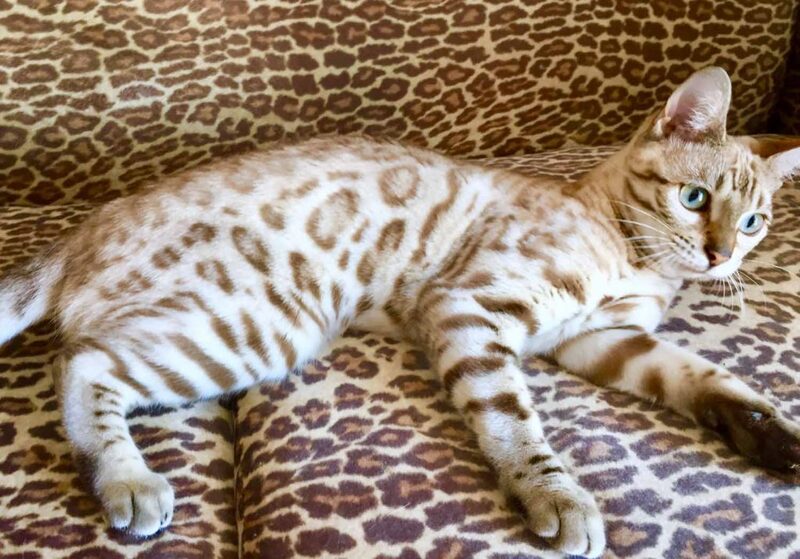 Todays’ Quality Bengals have well defined leopard print markings. Large round markings are often called donut rosettes. There is usually a darker outer ring, and inside the ring there is a lighter color. 3. 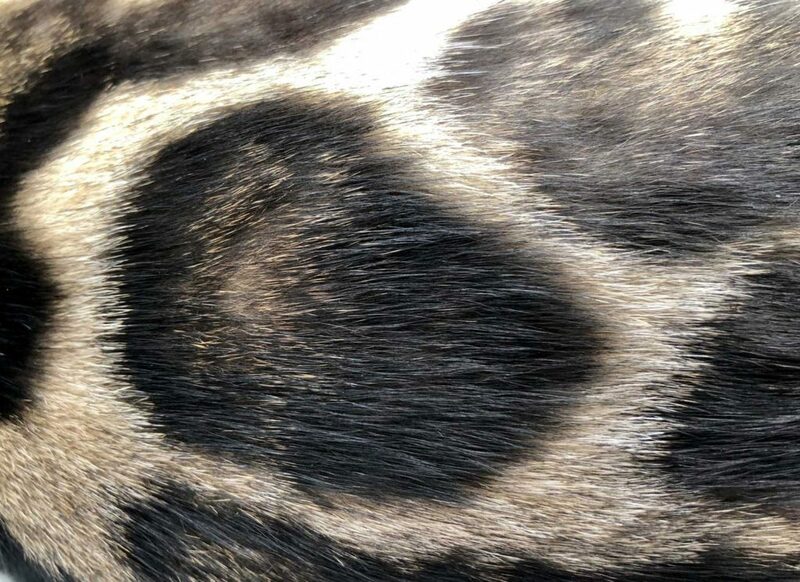 Clouded Leopard markings are huge irregular rosettes that resemble the wild Clouded Leopard. These markings are very dramatic looking. A quality Clouded Leopard many have huge rosettes, but they don’t loose the “leopard” markings of darker outer ring and lighter inside the ring. Marking too large will loose the leopard print and be considered “marble” markings. Marbles are less desirable quality, because the leopard look is lost. Not all Bengals are equal! Not all Bengals have the same quality fur. The older generation Bengals have looser, coarse hair, and they lack the glitter or shine on their fur. Quality Bengals today have finer and tight/thick hair. They are soft and silky to the touch, and the shinny coat can be easily seen in direct light. Bengals have many colorful beautiful eyes. Brown Bengals usually have green or golden yellow eyes. Snow Bengals have blue or aqua eyes. 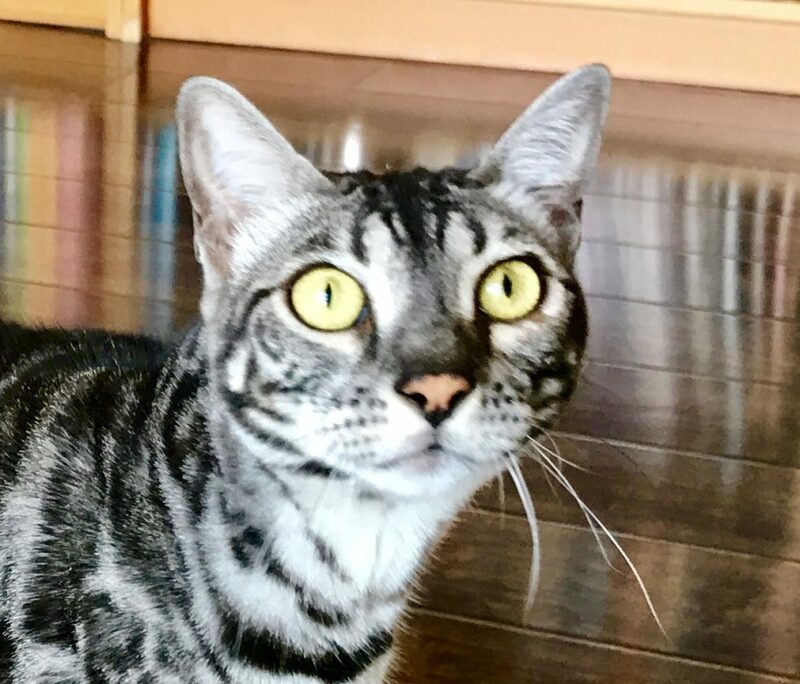 Silver and Charcoal Bengals usually have golden yellow eyes, but sometimes they can have green eyes. There are basically 4 color groups, they are all beautiful in their own way. Bengals comes in Brown, Snow, Silver, and Charcoal. Each color groups have color variations from light to dark. 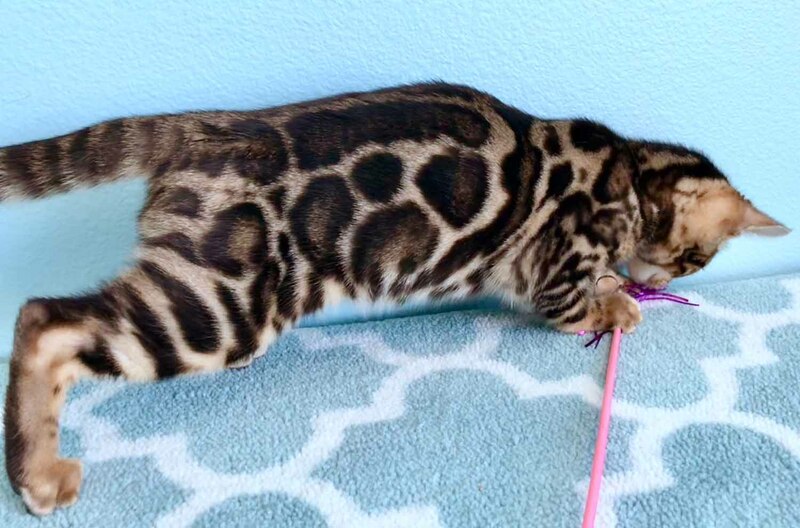 Bengals reaches their adult coloring about 10-12 months old. 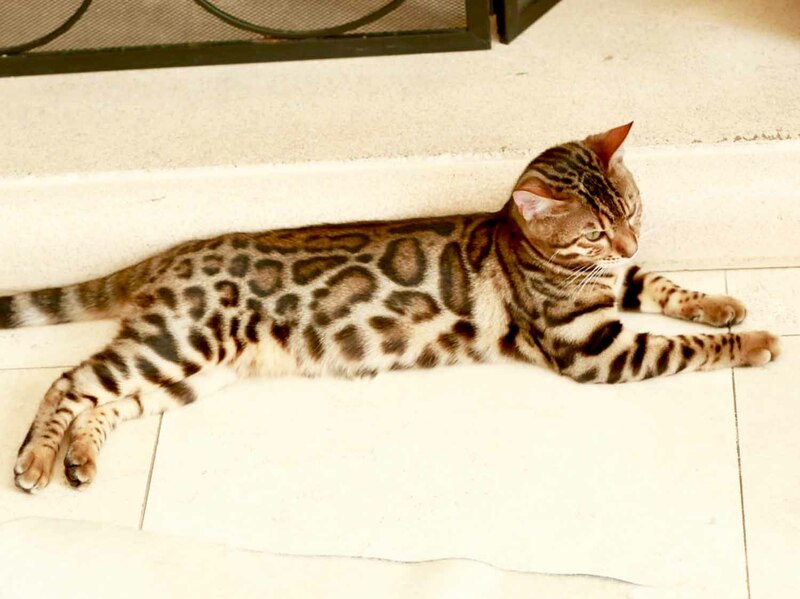 There is a wide color variations on Brown Bengals ranging from honey golden browns to dark black browns. All of them are beautiful in their own way. Usually black browns are most striking because black brings out depth of color and creates a wider contrast on the rosettes. Seal Lynx Point- Usually born pure white, very light markings at birth, it usually takes a few weeks for the markings to start to show. Some Seal Lynx can be born with darker markings. Seal Lynx Point always have “blue eyes”. Seal Mink- Usually born cream white, markings are visible at birth. Seal Minks Bengals usually have Aqua (Greenish-blue) or sometimes green eyes. 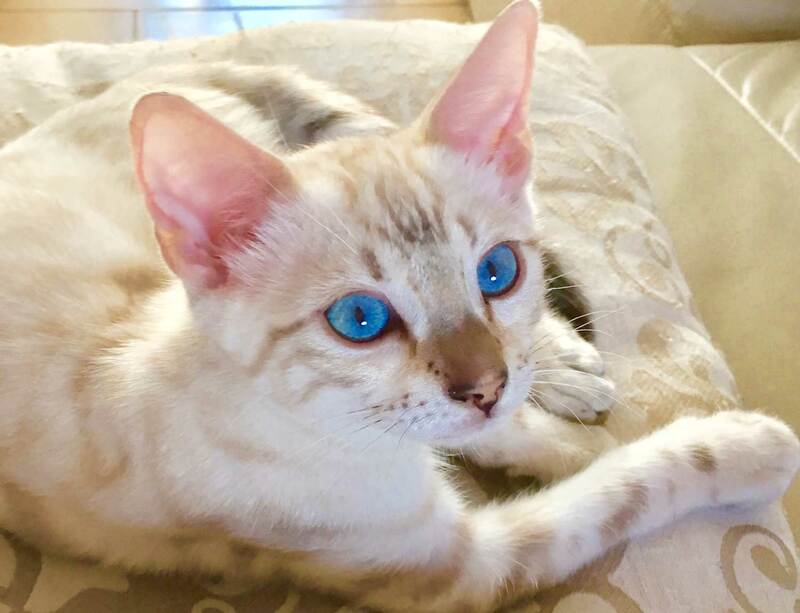 Like all Bengal colors, Silvers can be very light, almost like a Snow Bengal, but still have a Silver sheen or shine to their coat. They are called Silver Snows. They are much more rare to find. 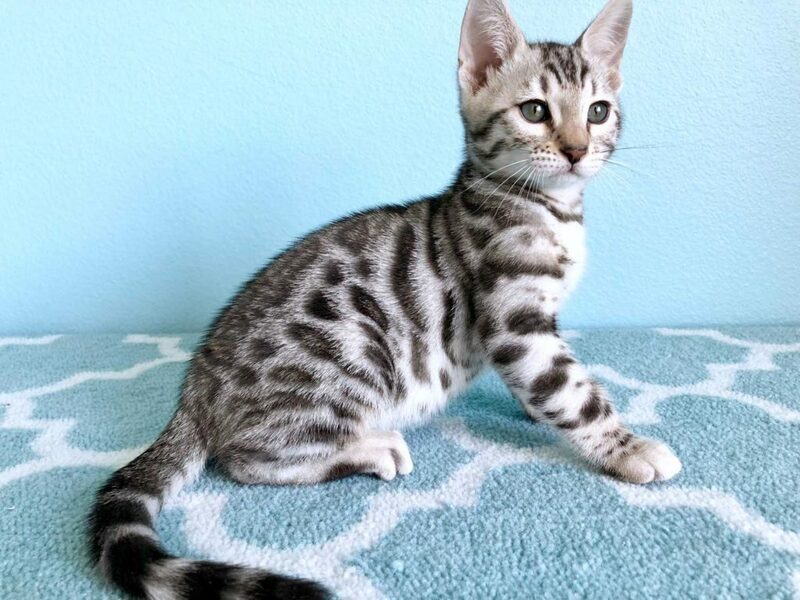 Most “Silvers” or “Gray” Bengals have a silver/gray background, and black or dark gray markings and rosettes. Quality Silvers are hard to find! Quality Silvers are not “tarnished” which means they do not have brown in their coloring. Lesser quality Silvers have a little bit to a lot of brown in the overall coloring, which makes them look “tarnished”. 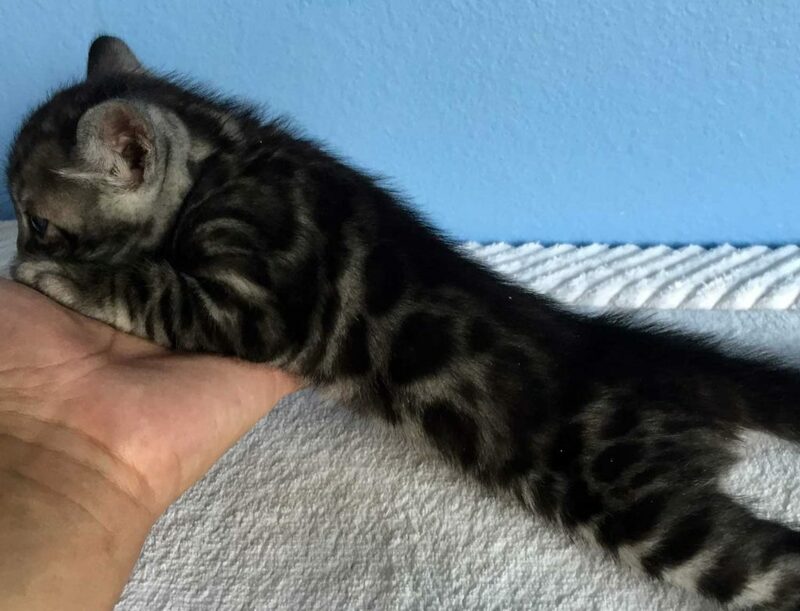 A quality Silver Bengal is basically a black and white or black and gray cat. Silver Bengals usually have golden yellow eyes, sometimes green eyes. Charcoals or Black Bengals resembles the Black Jaguar, or Black Leopard. They have a black cape, or black back. Their bodies can be from gray to almost black background and the rosettes are black. 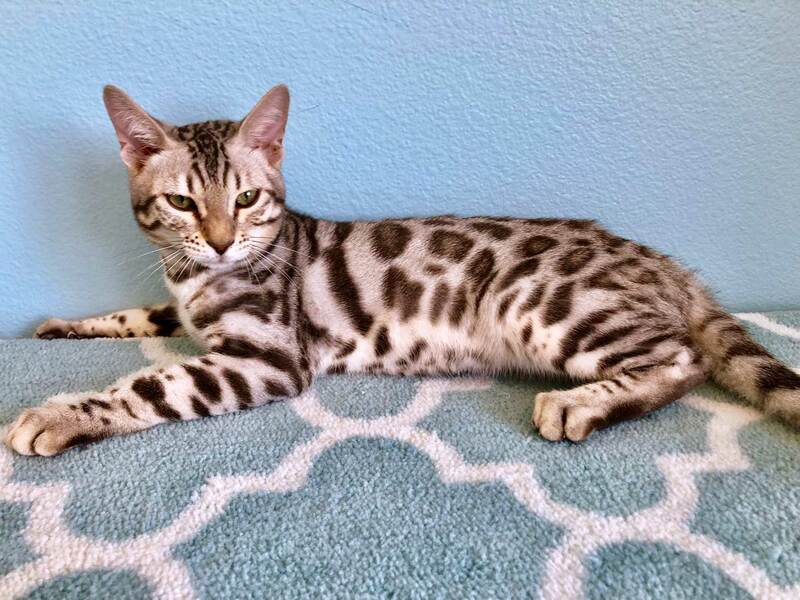 Like Silver Bengals, a quality Charcoal Bengal should not have any “tarnish” or brownish coloring. 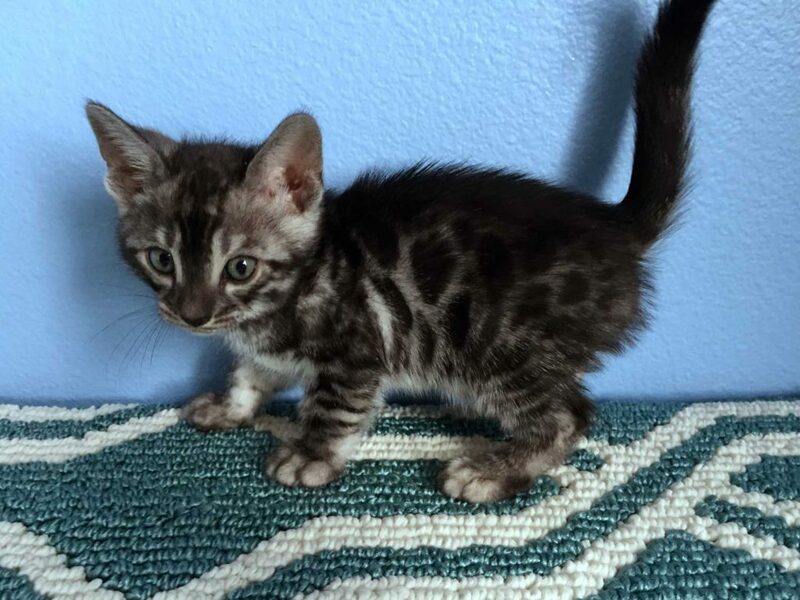 Charcoal Bengals usually have golden yellow eyes, sometimes green eyes. The first 3 generations (F1,F2,F3) from the wild are considered "hybrid" and they are not recognized by The International Association (TICA) and The Cat Fanciers' Association (CFA) as a domesticated breed of cat, therefore they are not Pedigreed Bengals. The early generation "hybrids" have no official breeding records or pedigree. In most cases, they are false claims with no official proof. In many countries and US states these "hybrids" are illegal to own, because they are not recognized as a domesticated animal. Make no mistake, there is no such thing as F4,F5...etc. If you see those advertised, they are false advertising, and it's not recognized internationally by TICA and CFA. Starting the 4th generations, they are considered as a “domesticated breed”. They are called SBT (Stud Book Tradition). A pure bred Bengal is a SBT Bengal. All our Bengals have at least 5 generations of SBT pedigrees, which means they are at least 8 generations away from their wild ancestors. Only legit register breeders can give you kitten registration paper from TICA. And only legit pedigrees are issued from TICA, not a computer print out from the breeder. Due to pedigree fraud, we do not post our pedigrees online. Posting real pedigrees online is an easy way for other people to copy and make fraudulent pedigrees. 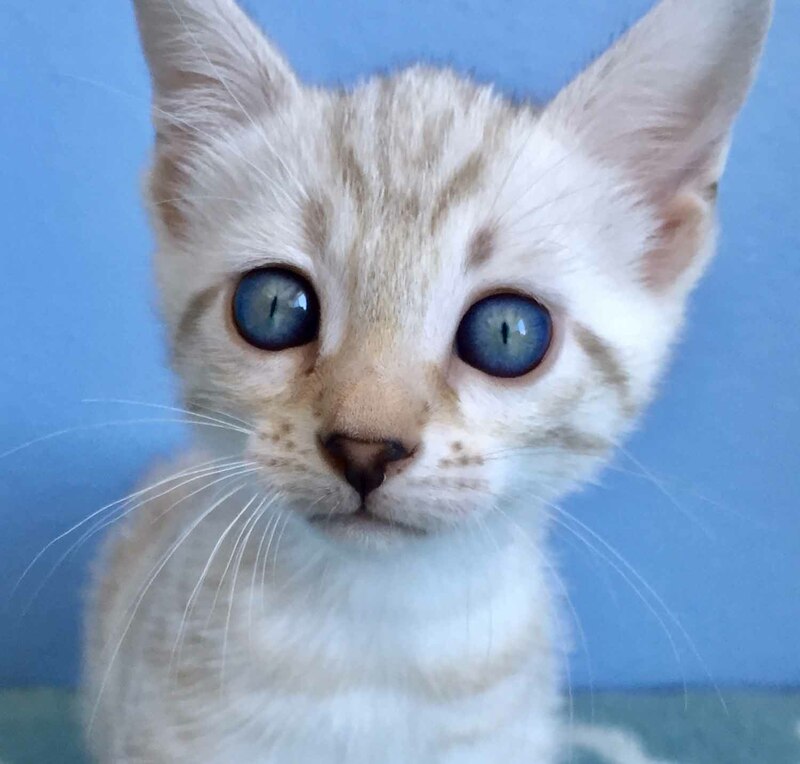 When visiting our cattery, we are happy to show you official TICA Pedigrees in person. All our breeding cats are show quality. Our kittens are often show quality. Although show winnings is never a guarantee, but we are proud to have champion kittens across the world. Bengals are a healthy breed. Unlike some breeds of cats, Bengals in general do not have any genetic health defects. It is also rare for Bengals to have feline leukemia. In the past some Bengals have shown to have heart problems. Part of keeping or buying healthy breeding cats is to have full annual health exams to make sure there aren’t any health issues that will result in death. As a responsible breeder, we do not be breed any cats with any known health issues. As a standard practice and pre-caution, all our cats are screened and tested annually by USDA accredited Veterinarians and all are in perfect health before we breed them. 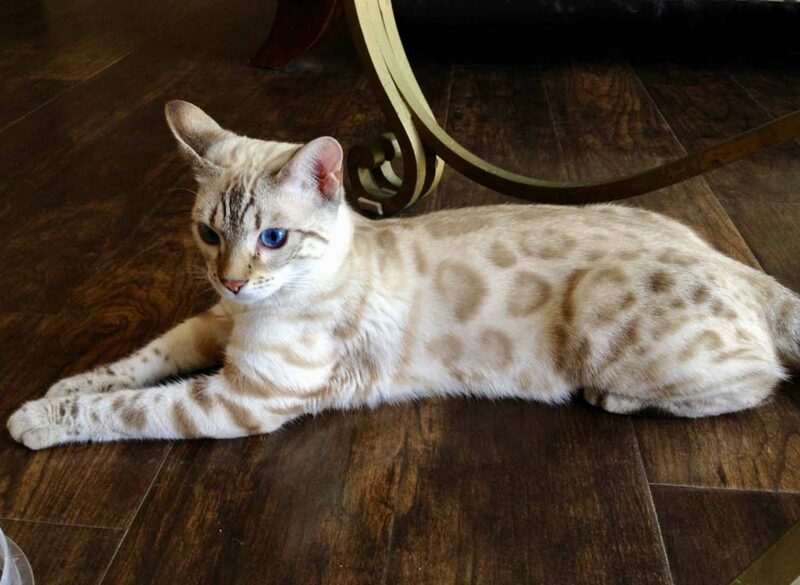 The word "Hypo-Allergenic" has been used a lot when describing Bengals. 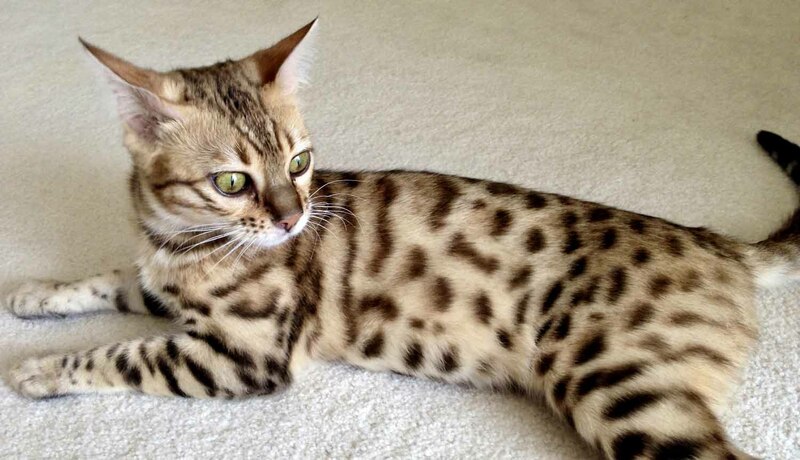 People who might be allergic to cats might be surprised to find themselves not allergic to Bengals. 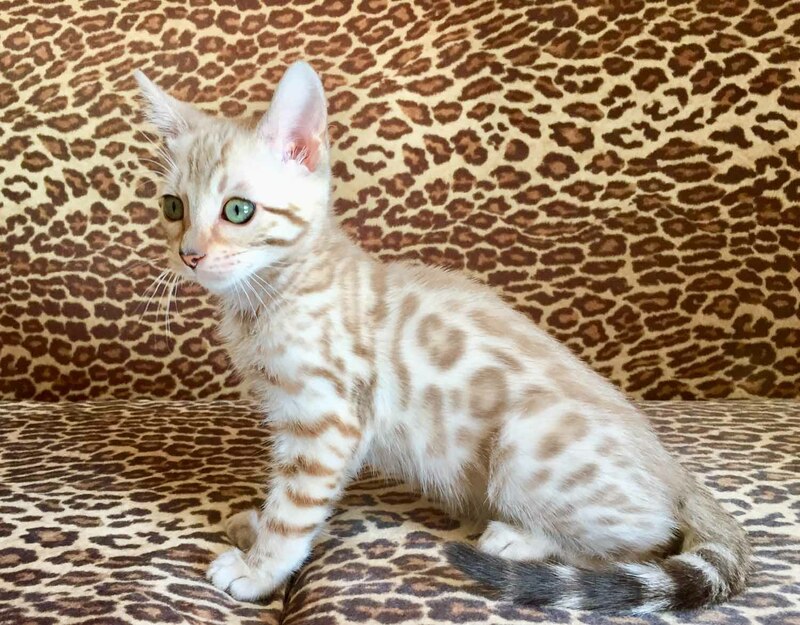 The best way to find out if you are allergic to Bengals is to visit a legit breeder and pet a pure bred Bengal for yourself to find out. If you are allergic to cats, we highly recommend you to see an allergy specialist before you decide to own a Bengal. As a breed, Bengals do not shed much compared to other cats. 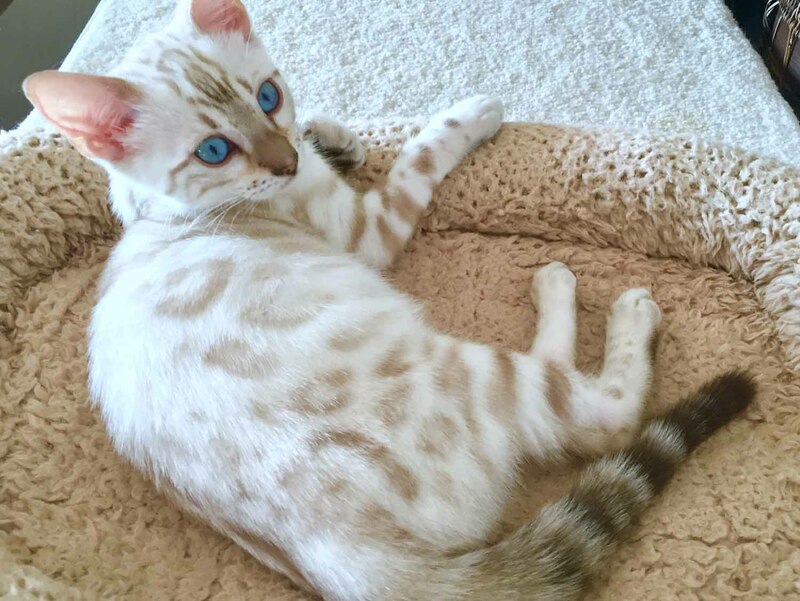 A high quality Bengal have very fine, tight, slick, shiny, silky coat. 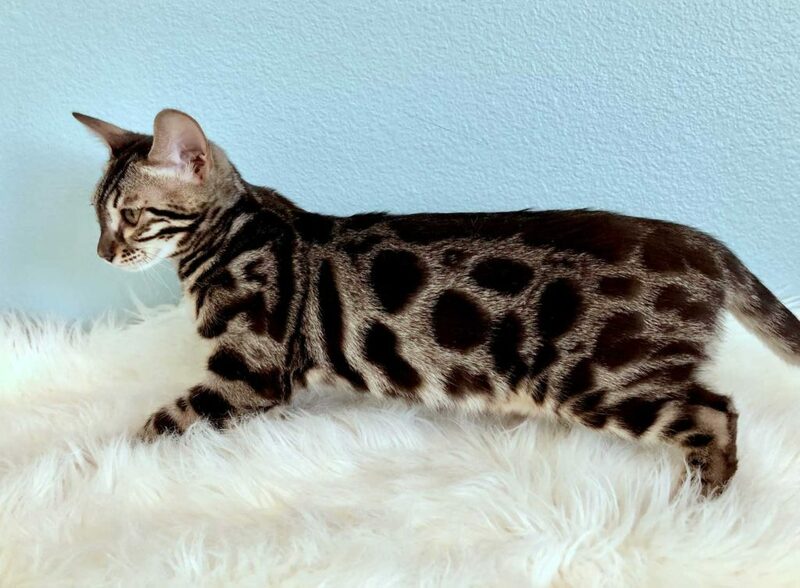 Some have said, Bengals feels like mink! They do not need to be taken to a groomer, which makes them easy to care for. As a good practice for those with pets is to maintaining a clean household. A clean home is the best thing for the health of both pets and their owners. Bengals are easy to care for. They do not need any special care or special diet. Bengals do not need to be fed raw meat to maintain good health. This is a heavily debated subject among Bengals owners. There are endless claims and opinions online. I’ve had extensive conversations with our USDA accredited veterinarians about this subject. I believe in the science and my veterinarians’ suggestions. Our Bengals are proof of excellent health without the danger of feeding raw meat. Our Bengals are fed with high quality cat foods that can be easily found in your local pet stores. They use standard litter boxes and litter. Bengals love to play with water, especially running water. 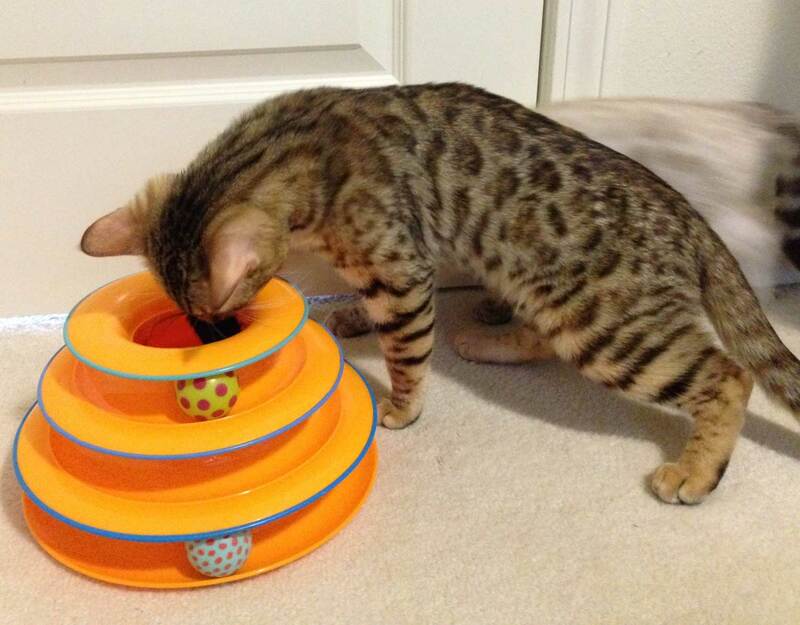 A large shallow bowl of water or a small pet water fountain with running water will keep your Bengals entertained. Bengals are very intelligent animals. They are friendly and affectionate towards people. In many ways Bengals are like puppy dogs, they are very active and playful, loves your attention. They will wait by the window to see you come home and run to the door to greet you as you walk in. They love to snuggle up to you while you are watching TV on the sofa or sleep with you in bed. Bengals can be trained to walk on a leash with a harness. Bengals are active athletic cats, they love to run and jump, a tall cat tree is recommended. 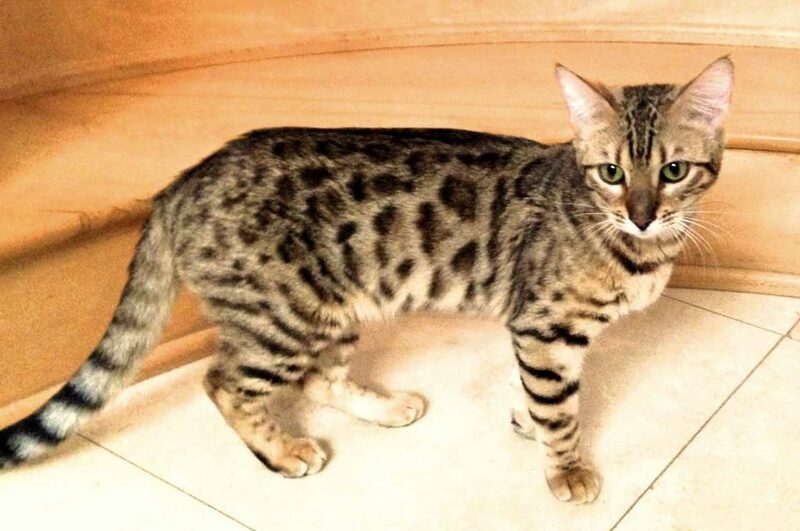 It is ideal to keep Bengals as indoor cats, because of their beauty and sweet nature, if you let a Bengal out running free, some people might take it and you might loose your beloved pet. Outdoor cats live a shorter life because they are exposed to many elements from wild animals with deadly diseases and accidental death. We encourage all cat owners to keep their cats indoors for safety.